Most of us love to eat, and a lot of us try to think about the food we’re putting into our mouths, and we try, where we can, to be health conscious. Thoughtful, or “mindful” eating is a good way to make a small change in our health and our lives. By changing what we eat in very small ways, we can also help our environment, too. Meatless Monday is a non-profit global movement started by the Johns Hopkins Bloomberg School of Public Health, with the aim of helping you “reduce your meat consumption by 15 percent to improve your personal health and the health of the planet.” Just that tiny step of going meat-free one day a week can make an impact on your own health, and the health of the global community! The origin of the Meatless Monday movement was borne out of the early years of the 20th century, when Presidents Wilson, Truman and Roosevelt declared voluntary meatless days during both world wars to help galvanize the nation. Supporters of the modern-day movement span all walks of life. Noted cohorts include Al Gore, Oprah, Sir Paul McCartney, author Michael Pollan (In Defense of Food), director James Cameron (Avatar), Padma Lakshmi (TV’s Top Chef) and renowned Chef Mario Batali, who has adopted Meatless Monday in all 14 of his restaurants. 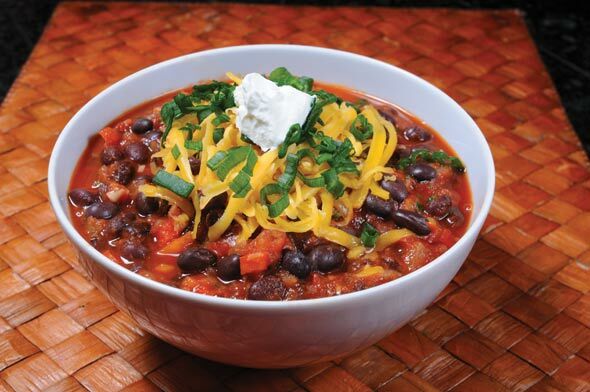 We asked a few local restaurants and chefs to offer up some of their favorite meatless recipes to help kick-start your own Meatless Monday movement. We’re pretty sure you’ll be pleasantly surprised: thanks to the offerings these chefs have put before you, going meat-free for a day looks positively mouthwatering! Visit meatlessmonday.com for more information. Submitted by Whole Foods Market, 270 Palladio Parkway, Folsom, 916-984-8500, wholefoodsmarket.com. Heat a large stockpot with 4 tbsp. of olive oil. Add garlic, onion and yellow pepper; cook while stirring occasionally (approximately 4 minutes). Once the vegetables have cooked down, stir in carrot purée and tomato paste; season stockpot with juice from lime, coriander, New Mexico chili powder, sea salt, black pepper and cayenne pepper. Add 2 quarts vegetable stock and increase heat to high; once simmering, reduce heat. Add crushed tomatoes, roasted red bell peppers, corn and black beans, then cover pot. Cook for additional 25 minutes and serve! Add more salt and pepper, to taste. Submitted by Papa Gianni’s Ristorante, 3450 Palmer Drive, Suite 1, Cameron Park, 530-672-2333. Combine first six ingredients in a blender on high speed for 10 seconds (don’t over-blend). Once mixed together, set aside. Cook spaghetti in boiling water for 9-11 minutes. Drain spaghetti over a colander and return to pot. (Do not let pasta cool.) Immediately toss sauce in with noodles. Serves 2. Submitted by Francie Cruz at Bocca Catering in Folsom, 916-834-3554, boccacatering.com. Heat oil in pot on medium heat. Add onions, bell peppers and garlic. Sauté until onions soften, about 8 minutes. Add chili powder, oregano, cumin and cayenne. Add beans, reserved bean liquid, tomato sauce and chopped tomatoes. Bring chili to boil, stir mixture, and then reduce heat to medium. Simmer for about 30-40 minutes. Chili will thicken. Season to taste with salt and pepper (it’s the salt that is key). Top with a little chopped cilantro, a dollop of sour cream, grated cheese and green onions. Enjoy! Submitted by ZacJack Bistro, 3275 Coach Lane, Cameron Park, 530-676-2969, zacharyjacques.com. 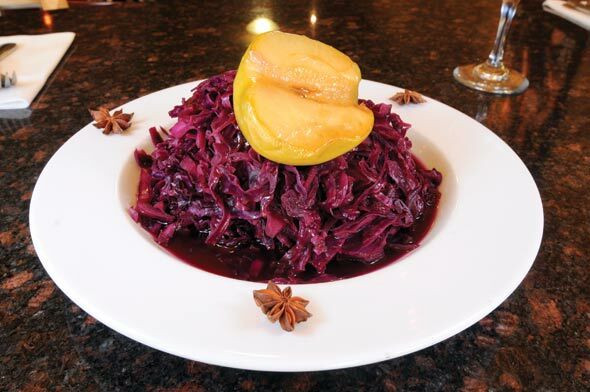 Sweet and sour cabbage is a classic German side dish. ZacJack Bistro’s recipe has a twist, using maple syrup instead of sugar. Place cabbage, apple and 1 cup of the water in a large pot over medium heat; cook for 10 minutes. Add ¾ cup maple syrup and vinegar, then add cloves. Cook covered for 1 hour over low heat. Check every 15 minutes; add water if needed. Add salt and pepper to taste and adjust the cabbage with the leftover maple syrup and vinegar. Submitted by Paul Martin’s American Bistro, 1455 Eureka Road, Roseville, 916-783-3600, paulmartinsamericanbistro.com. Heat the oil in a skillet; add the garlic, shallots and chili flakes until just hot and sizzling. Add the onions and salt, and continue sautéing for 1 minute. Add the white wine and broccolini; cook 2 minutes. Add the snap peas and spinach; continue cooking for 1 minute, then toss (do not overcook the spinach). Add the basil, yellow tomatoes and vegetable stock; stir quickly. Add the fresh cooked linguine and toss to mix (the idea here is to coat the pasta and just warm the basil and tomatoes, so the flavors open up!). *To cook pasta: Bring 2 quarts of water to a boil. Add a pinch of salt to the water and gently add the fresh linguine; agitate so the pasta does not stick together! Fresh pasta cooks in about 1-2 minutes, al dente. Drain, but do not rinse the pasta. Do this prior to beginning the quick sauté of vegetables. **To blanch: Bring pot of salted water to boil. Add broccolini to water and cook for 2 minutes. Remove and immediately add to large bowl of ice water to stop cooking process. Drain and dry. ***To chiffonade: Stack basil leaves evenly, roll width-ways into tight cylinder, and slice finely crossways to create thin ribbons. Oils: olive, sesame, peanut, dried herbs: the more the merrier! Cheese: Parmesan, Cheddar, jack, Swiss, to name a few! 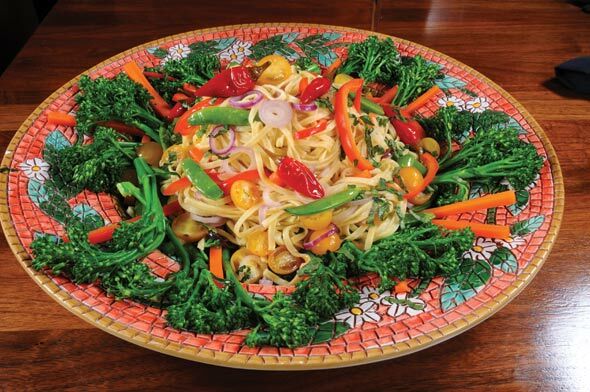 Vegetables: spinach, kale, carrots, peppers, zucchini, squash, mushrooms, broccoli, cauliflower, cabbage, tomatoes, green onions, yellow onions, red onions, garlic, shallots and sweet potatoes, to name a few!